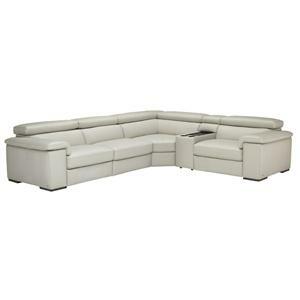 Sit back, relax and enjoy your favorite music in this stylish sectional sofa. 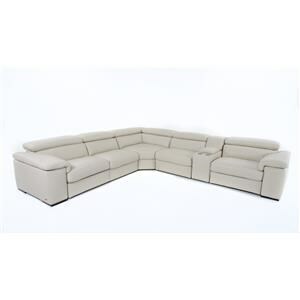 This sectional has fused technology, comfort and luxury for the ultimate group lounge piece. 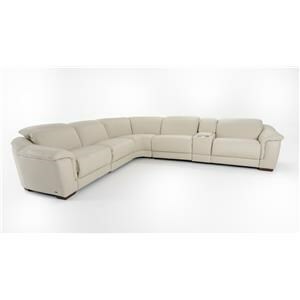 Handsome in its appeal, this gently curved sectional with a crescent shape exudes unique style and sophistication. Offered as a seating system, which allows you to build for maximum capacity, including its ratchet headrest and electric motion to personalize the right balance of style and personalized comfort. 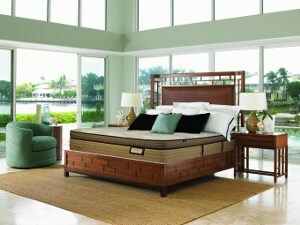 Luxurious large hides are used on this timeless design, which hallmark the fine Italian quality and craftsmanship. 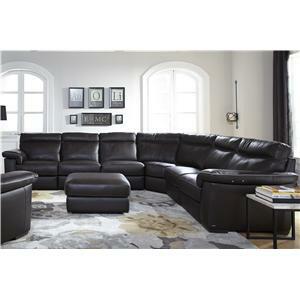 The B641 Contemporary Leather Reclining Sectional Sofa with Storage Console by Natuzzi Editions at Baer's Furniture in the Ft. Lauderdale, Ft. Myers, Orlando, Naples, Miami, Florida area. Product availability may vary. Contact us for the most current availability on this product. 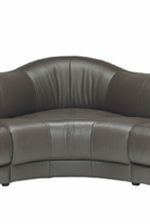 B641-362 RAF Recliner 1 46" 41" 33"
B641-399 Large Corner Wedge 1 62" 62" 33"
B641-323 Console 1 15" 40" 33"
B641-328 Armless Recliner 2 33" 41" 33"
B641-360 LAF Recliner 1 46" 41" 33"
Fabric Content Upholstery is refined fabric collections from the best textile industries in Italy. 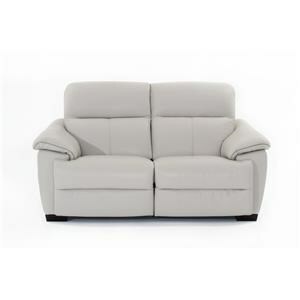 Superior style, comfort and technology come together in the B641 upholstery series. 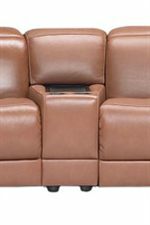 With an assortment of motion sectionals to choose from, this group is perfect for your contemporary family room or home theater. 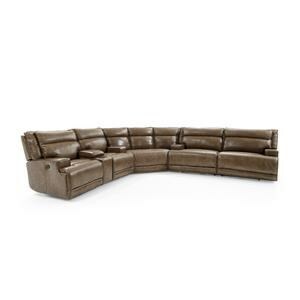 Each seat is luxuriously upholstered with top-grain leather, exuding a sleek style that is also soft and supple. 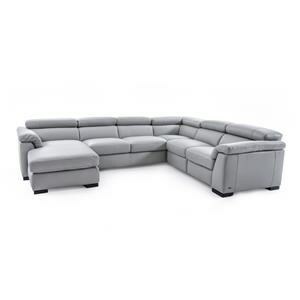 Built-in storage consoles with cupholders, and unique, adjustable headrests round out the comfort and convenience of the B641 sectional group. The B641 collection is a great option if you are looking for Contemporary furniture in the Ft. Lauderdale, Ft. Myers, Orlando, Naples, Miami, Florida area. 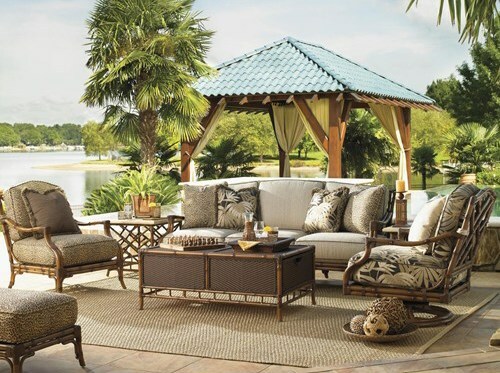 Browse other items in the B641 collection from Baer's Furniture in the Ft. Lauderdale, Ft. Myers, Orlando, Naples, Miami, Florida area.